It looks like the advice of political pros has begun to sink in with national GOP leaders and they’re starting to back off slightly from their absurd “no way, no how” stance when it comes to considering an Obama Supreme Court nominee in 2016. How else to explain the fact that they’ve allowed a junior, non-lawyer backbencher like North Carolina Senator Thom Tillis to publicly express the concern that his Republican colleagues shouldn’t go down the road of becoming “obstructionists” when it comes to a nomination? Of course, as welcome as Tillis’ change of tone is, it still falls well short of being truthful and/or helpful for at least two big reasons. Number One is that despite expressing concerns about not even considering an Obama nominee, Tillis went on to make clear that he still favors what can only be called obstruction. According to the senator, unless the President essentially nominates the second coming of Antonin Scalia, “we’ll use every device available to block that nomination.” In other words, Tillis’ isn’t really opposed to obstruction of a nominee — just the appearance of it. Number Two is the blatant hypocrisy of Tillis’ stance. You see, despite his professed concerns about being an obstructionist, that is actually the only way one can fairly characterize what the senator has been ever since he arrived in Washington last January and somehow managed to wangle an appointment to the Judiciary Committee. As the good folks at People for the American Way, the Center for American Progress, Defenders of Wildlife and many other groups have been documenting for years, Senate Republicans have been obstructing Obama court appointees with such regularity that the whole thing has long since descended into farce. Throughout the country, dozens of important federal judicial slots stand vacant — many for years — all because GOP senators won’t consider and confirm nominees at a reasonable pace. Heck, here in North Carolina, the vacancy in the Eastern District federal court is so old that the Obama administration has given up on even appointing someone. It’s so bad and so ridiculous that the delays of month and years have even occurred for nominees who have ended up getting confirmed unanimously. If Tillis is so concerned about being an obstructionist, why has it taken him 13 months to speak out — especially when he serves on the committee that does most of the obstructing? 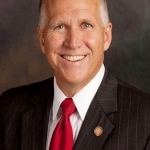 The bottom line: Let’s hope Tillis’ statement heralds a real change in the senator’s behavior and that of his colleagues, but given his record and absent genuine action anytime soon, it’s safe to assume that the new stance is all for show. To seem and not to be, the North Carolina GOP’s unspoken motto.